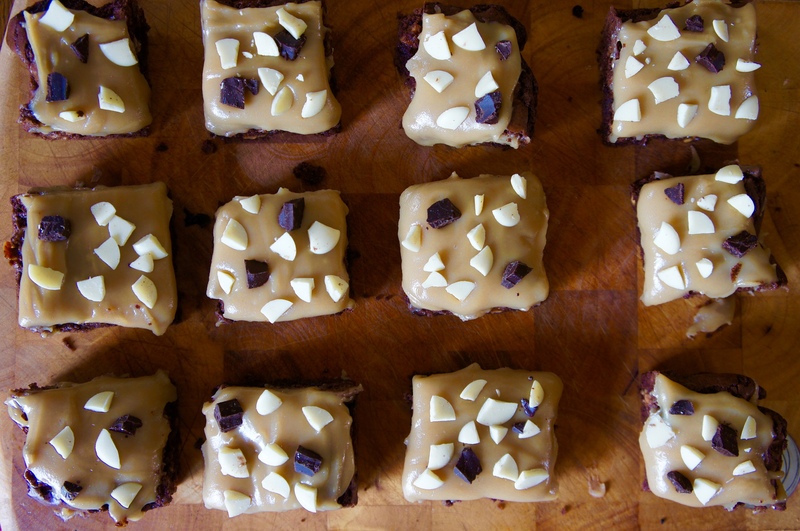 These are the most outrageous brownies ever. Chocolate on top of caramel on top of chocolate on top of… you guessed it more chocolate! Preheat the oven to 180°C. Lightly grease and line a 23x23cm baking tin with baking paper. Melt the butter and dark chocolate in a bowl set over a pan of water on a medium heat. Stir with a wooden spoon until fully melted, remove from the heat and leave to cool. In a separate bowl, whisk the eggs and sugar until frothy. Now add in the chocolate mixture and the flour and fold together until fully combined. Transfer 3/4 of the mixture to the prepared tin, smoothing it out into an even layer. Now dot the Snicker chunks all over on top of the brownie layer. 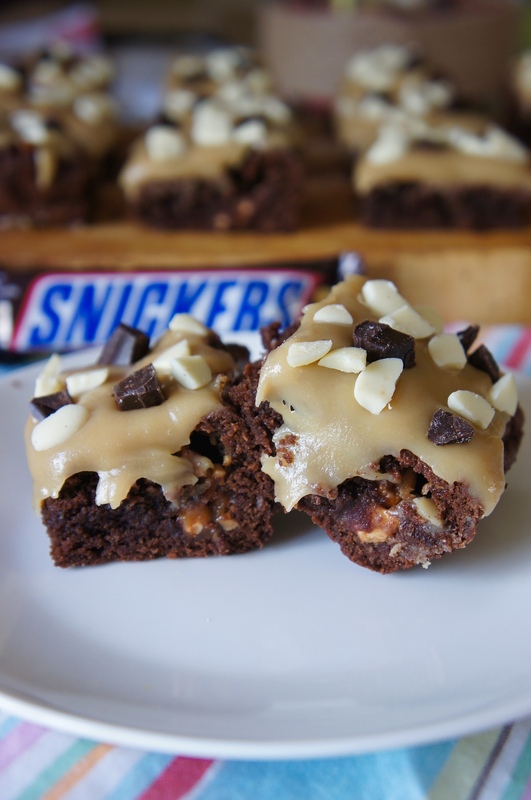 Pour the remaining brownie mixture on top and use a spoon to conceal the Snickers. Bake in the oven for 25-30 minutes – until the top is no longer shiny and the edges have started to crack. Leave to cool completely. First measure all of the ingredients into a medium-sized saucepan. Now, on a low to medium heat, melt the ingredients gently until smooth and the sugar has completely dissolved. Turn up the heat and bring the mixture to a boil, stirring all the time. Reduce the heat and simmer the mixture, stirring continuously, for approx. 15 minutes until it has thickened slightly. Turn off the heat and leave the caramel to sit for 5 minutes to thicken up. 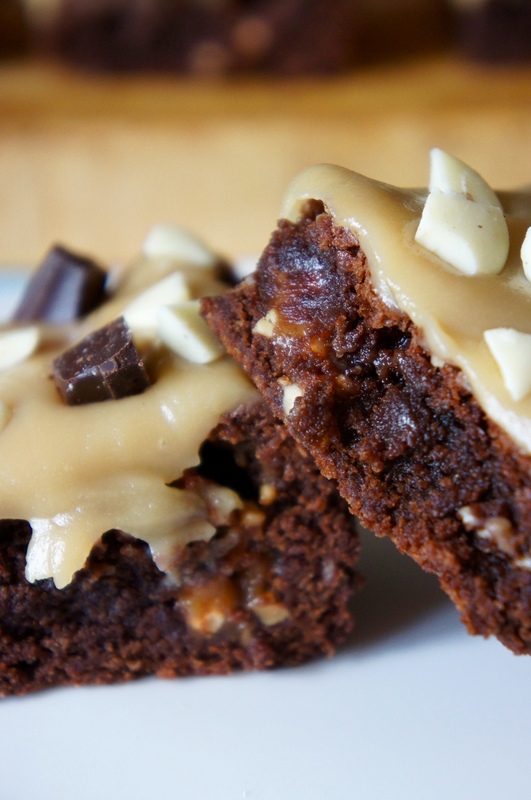 Pour the caramel on top of the brownies and use a spoon to spread it into an even layer, covering the whole top. Leave to cool (approx. 20 mins) before scattering the chocolate chunks on top, cut into 12 and serve.